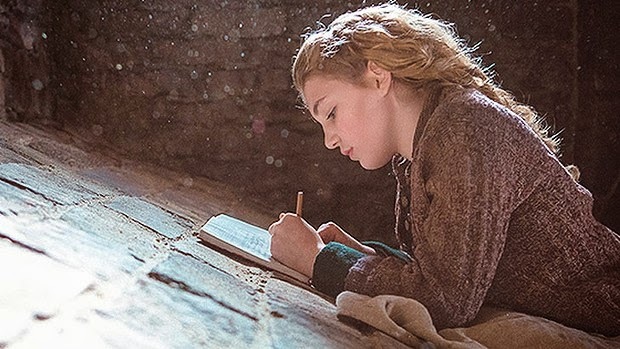 Film vs. Book: What will Brian Percival do with The Book Thief? What will Brian Percival do with The Book Thief? It's not often that I am quite this scared - and excited - to see an adaptation. It's partly because I'll be seeing it with the rest of the #bookvsfilmclub but it's basically because I am just genuinely intrigued to see what the director Brian Percival has done with this incredible story. The casting looks incredible from the trailers alone. Sophie Nélisse looks like a new Chloe Moretz, capturing the innocence of youth but dealing with the very adult emotions her character is forced to experience. Her foster parents are both incredibly detailed characters and so very integral to the story so it is exciting to see Geoffrey Rush and Emily Watson play Mama and Papa. To write a book from the perspective of death is a bold move, to say the least, especially when the book in question takes place in Germany during World War II. Somehow, author Markus Zusak took something so dark and made it something beautiful. It is tragic and heartbreaking but there is joy and hope to be found amid the rubble. According to IMDB, there is a narrator/death to the film but will the beautiful language of the novel remain for the adaptation? To read my 10/10 review of the book, check out Novelicious. For more information on the book vs film club, email me at filmvsbook@gmail.com.